Every new stage in life involves some new learning. No matter how much anyone tries to prepare you for a new stage of life or how much you read about your new destination; there are some lessons that are only learned through the school of hard knocks. And since this blog is about LIVING LEARNING mobile, why not share some recent “learning”. I'm not usually a high maintenance girl, but one thing I've accumulated over the years is a very fun and versatile collection of glassware. I knew that 9 champagne flutes, 4 martini glasses, a dozen wine glasses, a half a dozen cordial glasses, juice glasses, beer glasses, tall water glasses, and the ever so practical size milk glass weren't going to accompany us on this trip, but I could not bring myself to give or sell my collection. So these made the cut of things that would survive storage in somebody's attic. But that doesn't mean I succumb to drinking wine in the multipurpose LL Bean blue plastic cups which Craig has assured me can be a coffee cup, soup container, measuring cup and any other container one might hope for on the road. I rearranged the dishes and was pretty tickled when I found room for 4 wine glasses and 2 martini glasses. Craig just shrugged, smiled, and accommodated me. School of hard knock lesson #1 - Stemware was not made for small RV size kitchen. Okay…I get it, now. So when we got down to a single wine glass, I had another bright idea and measured the opening of the wooden glass holder, and found stemless wine classes that were narrow enough to fit these. School of hard knock lesson #2 - Stemless wine glasses are no better at surviving the RV kitchen. Down to one solitary wine glass, I noticed a set of red trimmed goblets in a thrift shop in Cedar Key that looked like they might survive our lifestyle. Who would have thought that plastic wine glasses would have made their way home with Lucie. Ah well. We have all heard it many times, but what does it take for us to actually prepare for "shifted content". Well for me it was when my Chromebook (that was neatly tucked away in my overhead office bin) came flying out and landed squarely on my once unblemished Macbook air (sitting on the living area table - a.k.a. Lucie and Craig's shared office desk). Who would have thought that this wimpy little plastic Samsung Chromebook could put a huge dent into my shiny well built Macbook Air. Sigh! I guess having a dent in ones Macbook is something I can live with. 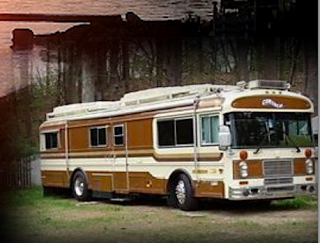 Much like an old house, our old bus could use a few more outlets around the couch area. Unfortunately, that’s where I like to sit and my old Windows laptop usually needs to be plugged in making its power cord the perfect trip hazard. In a recent entanglement, my old Lenova offered just enough resistance to bend the connector so the power cord no longer fits snuggly enough to keep the laptop charged. With just the right amount of tweaking I can get enough of a charge to do the few things I still need my Windows machine for. Despite the fact that my coffee was in a covered travel mug nestled in one of the two cup holders on the bus , enough java managed to to jump out to splatter on my Macbook. School of hard knocks lesson #6 don't assume that the shiny new red protective cover you just added to your Mac book protects it from all types of damage. Especially when that protective skin traps a dash of liquid inside so you don't know that you have actually marinated your computer for days, until the screen starts to flicker and dark and dim sections of the screen move around from left corner to right corner. I assumed that the Apple Care I have been buying with all my Apple products was there to help people like me that are hard on their technology. Last week I learned that all it takes is a little bit of moisture to trigger a liquid sensor that disqualifies your $700 computer repair from being covered by Apple Care. When we drove to Gainesville to retrieve my “unrepaired” Macbook Air from the Apple 'hospital", I did get to handle a new Macbook Pro Retina and was impressed by the lack of difference between its weight and that of my Air. (something to ponder) Thankfully I can continue using the Air with an external monitor for now. It’s been great to bounce back and forth between inside and outside workspaces, but all that moving around requires extra precaution. Hours after unpacking and setting up a brand new iPad mini, Craig gathered his ‘mobile’ tools to move inside when his new iPad mini slid out of his hands and landed on the cement pad outside our bus. The screen now has a 3 inch crack. ;-( Thankfully Craig’s experience handling the technology needs of schools has included repairing many iPad screens. Parts are on order. We’re thinking that the iPad might have had a better chance of survival if it had landed on the the outdoor patio carpet instead of a concrete slab. Note to self: Always roll out the carpet for yourself! 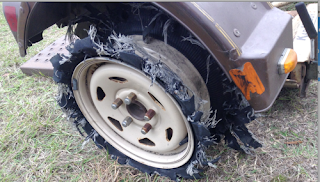 We have no idea what caused the right tire of our tow dolly to shred (8 miles before our arrival at Cedar Key) but we took it as a reminder that we needed to be more diligent about checking the air pressure on all tires (not just the bus, but also the dolly). Thankfully this lesson happened on Route 24 instead of on Interstate 95. A friendly local musician stopped and offered us both help and advice about where we might find a replacement and another local resident agreed to let us store the dolly in his driveway for a few days while we secured a new tire. We’ve decided to take heed of this warning to double check our tire health frequently. Probably the most important lesson learned so far in this trip has been to pay attention to how your body is reacting to change! Although I was still able to use my Macbook Air when tethered to an external monitor, it no longer served me when I wanted to move outside. Craig lent me a new Windows 8 Lenova that he uses to support the students and teachers back in Vermont . As soon as I started to use this slick new laptop, I found myself cursing the trackpad . I decided that it was just a matter of my learning the new Windows 8 gestures, and that this would be a “good” thing for me to practice and would help me better support educators who use this platform. The more I used it the more I felt my neck strain as my right hand tried to use a trackpad that was trying to emulate the “touchscreen” functionality built into Windows 8. (BAD IDEA!) Craig has deployed 100 of these Windows 8 Lenova laptops and almost 90% of them have been downgraded to Windows 7 OS by request of the user. Between the trackpad and my already questionable posture, I kept feeling the strain in my neck increase, but I kept working in 5th gear for long hours at a stretch to support students' final projects, get grades in for my 3 online graduate courses, and also launch a few new projects before everyone left for holiday break. Unfortunately, I am now going to be spending my holiday break looking for remedies to make my arm, neck, back strain go away and regain the range of motion I seem to have lost in my neck. 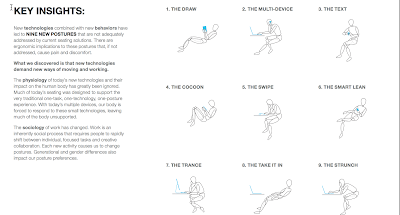 I bet that those of us living and learning mobile could add a few additional insights to this study of New Technologies, New Behaviors, and New Postures. 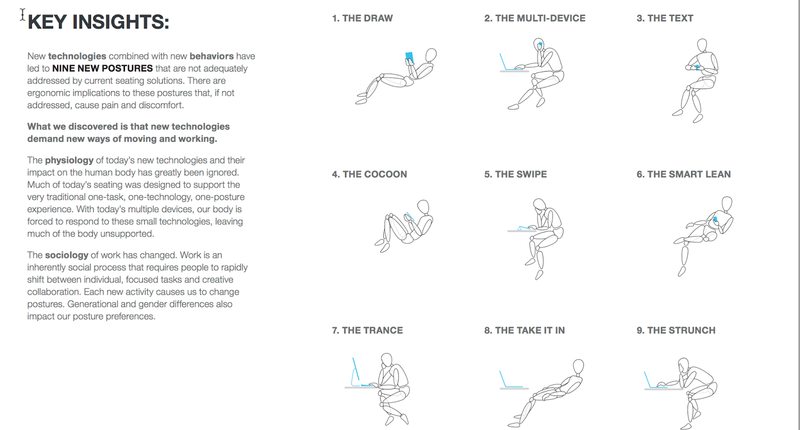 I wonder if Steelcase might consider creating a “mobile” chair that could accommodate today’s new generation of mobile workers! But one thing I am enjoying with my new purchase is that being untethered again is absolutely helping me take fuller advantage of living learning mobile! What is it about Cedar Key?